This vest features red and black paisley digitally printed silk lining and has two full width inside lower pockets. With summer coming on this1.6 mm buffalo leather is a lot cooler to wear than our thicker leather vests. We have in stock currently sizes from small to XL , other sizes are made to order - Please contact us to order. 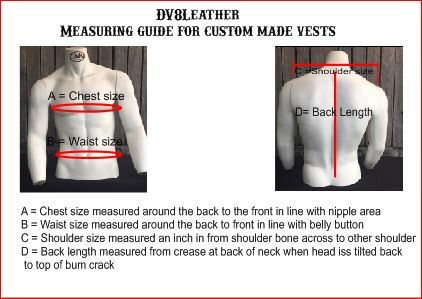 If you need a custom made size see the measurement guide below.